Sister Donna Marie Woodson’s college dream was to serve the disabled and she wanted to devote her life to bringing comfort and joy to those who suffered. She accomplished this in both near and far-reaching ways. As a Franciscan Sister and a physical therapist, Sister Donna Marie has shared her gifts of healing with others. She did this in the Sister-sponsored hospitals in Springfield, Highland, Belleville, Litchfield, and Breese, IL along with Eau Claire, WI. In addition, she worked with Edgewater Physical Therapy Associates (Chicago), St. Francis Clinic (Beardstown), and was a Physical Therapy Instructor at The Chicago Medical School. In 1984 she was one of the founding members of the Assisi Bhawan Health Center in Bihar, India for polio, leprosy, and general medical patients. Her work as a physical therapist may have been the easiest part of her job because daily six kilometer walks to and from town were a necessity. She was involved in obtaining land, building the Health Center and housing, securing proper government registration, and finding workers to build parallel bars and other equipment. She also obtained grants from organizations in Germany, Holland, and the USA to pay for the Health Center, well-digging, a jeep ambulance, generator, and other necessities. While ministering in India, she was able to visit New Delhi, the Taj Mahal, Juggernath Temple, the Indian Ocean, Ganges River and much more. “One of my most treasured moments was when I met and talked with Mother/Saint Teresa three times.” This experience, along with working with her Order (Missionaries of Charity), made the lack of electricity, telephones, and water seem insignificant. “India made me aware of what we have here and the idea that it could be more evenly distributed,” Sister Donna Marie said. Sister Donna Marie was born in Omaha, Nebraska. She earned a bachelor’s degree in physical therapy from St. Louis University and a master’s degree in Franciscan Studies from St. Bonaventure University, New York. 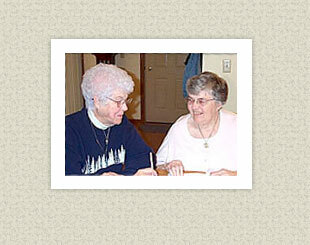 She entered Religious Life on February 11, 1960 and professed Final Vows on August 22, 1967. “I put off God’s calling as long as I could,” Sister Donna Marie said. “However, the Lord gets you when He wants you.” For her it was a moment when she was walking down the aisle before mass at St. Peter Cathedral in Belleville, IL. “I was dressed in my white uniform as a physical therapist and realized that one day I would walk down the aisle wearing white as either a bride or a Sister and then God told me the answer. I then had to explain God’s calling to my boyfriend,” she added with a smile. Over the years she has expanded her knowledge by learning skills in tai chi, acupuncture, and reflexology. She also served as an Early Intervention Physical Therapist in the five county area near her home in Jacksonville, IL and continues to work on the Local Intervention Board in Jacksonville. Currently she serves at Our Savior’s Parish, Jacksonville, as a 6th grade Public School of Religion teacher and also facilitates a Bible Study group of women from Beardstown, IL – an activity she has been involved with for seven years. In her free time, Sister Donna Marie enjoys swimming reading, crocheting, genealogy, and working with hospice services in Cass/Morgan and Schyler Counties. “Follow your dreams and do not be afraid to take risks in life,” Sister Donna Marie said. “I was once told to look for the beauty of India and I found it in so many wonderful ways. I hope that those who read this story will continue to look for the beauty in God’s world and reach out to others by showing care and love,” she concluded.